Most people don't realize that chives are actually in the medicinal herb family. The flavor is a cross between a mild onion and mild garlic, all depending on what you are serving. Chives (Allium schoenoprasum) is a part of the same botanical family as onions, scallions and garlic. They actually grow from small bulbs and have a long history of culinary and medicinal uses. In the Middle Ages, chives were promoted as a cure for melancholy and believed to drive away evil spirits. Today we know that chives and chive flowers are high in vitamin C, folic acid and potassium. Therefore, they should be routinely added to recipes to help restore vital nutrients lost in cooking. This herb's tangy aromatic taste come from its high concentration of sulfur compounds and other essential oils, which are also partly responsible for its healing properties. Chives can be started from seed but it's easiest to find a friend that already has an herb garden and dig-up a clump of their chive plant and get started growing your fresh chives. Once your herb garden is established and you start getting blossoms on your chive plants you'll quickly find that it's best to use scissors instead of pruning sheers or a knife on these plants. Scissors are especially useful when cutting your chives to prepare for your favorite dishes. This hardy perennial grows from 12 to 24 inches tall, with pink and lavender flowers that have flavored meals for centuries. It prefers full sun and moist, well-drained soil that high in organic matter. Planting rooted clumps is the easiest way to propagate chives. Seeds germinate slowly and require darkness, constant moisture, and temperatures of 60 degrees to 70 degrees F. Divide plants every few years. Chives also grow well in containers on a sunny windowsill or on your deck mixed with other herbs or edible flowers. It's just unbelievable how incredibly versatile chives can be. When you have an abundance of plants in your garden you can always make a chive bouquet. I have found that by placing a chive bouquet in the center of your picnic table, the aroma can enhance dishes placed around it. You can even use them as dried flower arrangements. They are very easy to dry and keep as edible flowers for your salads and soups. You may be surprised to find that chives ease stomach distress, protect against heart disease and stroke and may help the body fight bacteria that can cause disease. In addition, the herb may increase the body's ability to digest fat. 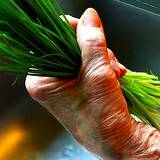 Therapeutic Effect:The medicinal properties of chives are as varied as their uses in the kitchen. Chives stimulate the appetite and promote good digestion. They can be used to ease stomach upset, clear a stuffy nose, reduce flatulence and prevent bad breath. Combined with a low-salt diet, they help lower high blood pressure. Plus, they have a mild diuretic effect, as well as some antibacterial properties. Components: Chives are valued for their many essential minerals, including cardiac-friendly potassium, bone-strengthening calcium and blood-building iron. And unlike most other members of the onion family, chives are high in folic acid (a B vitamin), vitamin A and vitamin C. In fact, just 3 ½ ounces of chives supplies enough vitamin C to meet your daily requirement of 60 mg. Cold Prevention: The high vitamin C content in chives can help prevent colds. They also speed recovery if a cold develops by helping the body to expel mucus; the sulfurous compounds in chives are natural expectorants. Cholesterol Reduction: Scientific research shows that chives stimulate the body's digestion of fat. Eaten regularly, chives may help lower blood cholesterol levels. Don't overlook the chive flower. The chive's delicate purple flowers have a milder flavor than the leaves and stems and add a decorative touch to salads, herb oils and other dishes. 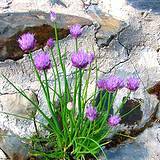 Chive Flavored Oil: add 1 ½ ounces of chive blossoms to 1 quart of vegetable oil. After a week, the oil will turn lilac and take on the fragrance of the chive flowers. Use the oil on salads or in cooking. Keep it refrigerated when not in use! Chive Salt: If you like the oniony flavor of chives, make your own Chive Salt to add zip to all sorts of dishes. First, add some chive leaves to some salt. Then bake the mixture in the oven to dry the leaves and blend the flavors. Store in an airtight jar. 1. Blend the cottage cheese and mustard. 2. Peel the shallot, chip finely and mix with the cottage cheese blend. 3. Wash and dry the chives and snip them finely. Stir about two-thirds of the chives into the cottage cheese mixture. 4. Season the cottage-cheese mixture with the paprika and add salt and pepper to taste. Sprinkle the remaining chives on top. Cut chives just before you are ready to use them to preserve their vitamins, aroma and flavor. Chives are delicate; to prevent the loss of essential oils, snip them with kitchen shears rather than chopping or grinding. Don't heat chives or they will lose their valuable vitamin C as well as their digestive properties. Grow chives at home in a pot on a windowsill. Wait until the plant reaches about 6 inches in height before cutting. Harvest the chive leaves frequently to prevent blooming unless you specifically want to use the flowers. Once the plant blooms, the leave become less flavorful. Freeze chives for future use. Frozen chives tend to retain more flavor than dried chives. Snip fresh chives into small pieces, then place them in an ice-cube tray and fill it with water. To thaw, put a chive cube in a strainer.